A miniature piece of Bloomsbury history - this small bookplate by Dora Carrington measures 1 3/8 inches high by 1 3/4 inches wide in it's largest version. The large version is rarer than the smaller but both have now become quite elusive. The tiny postage stamp size one measures only 1" by 3/4 ". 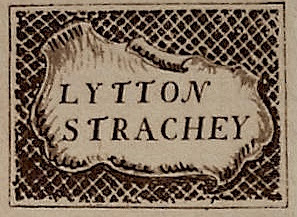 Both have the words Lytton Strachey in a plaque or cartouche with folded edges surrounded by net-like cross hatching in a dark sepia tone. A relic of the artist and Bloomsbury goddess. Carrington wrote of this bookplate in her diary (March 20 1931) rather prophetically:- 'As I stuck the book plates in with Lytton I suddenly thought of Sothebys and the book plates in some books I had looked at, when Lytton was bidding for a book and I thought: These books will one day be looked at by those gloomy faced booksellers and buyers. And suddenly a premonition of a day when these labels will no longer (be) in this library came over me. I longed to ask Lytton not to stick in any more.' He died 10 months later. Carrington shot herself a few months after. Anonymous. [Lytton Strachey, Saxon Sydney - Turner, Clive Bell, Walter Lamb and Leonard Woolf & others.] EUPHROSYNE. A COLLECTION OF VERSE. Elijah Johnson, Cambridge 1905. In our last copy a pencilled note by a bookseller stated the book came from the collection of Raymond Mortimer and Francis Birrell - the only other time I have seen this book was in the collection of Dadie Rylands. Although VW mocked the writers for their 'overweening seriousness' this is a fascinating piece showing the very earliest manifestation of the Bloomsbury set as a coherent group. It is a book unlikely to surface outside of Bloomsbury writers collections and is decidedly scarce. I heard of a third copy going through CSK at the sale of the library of Lytton Strachey’s sometime lover Roger Senhouse (1899-1970) who was a translator of Colette and a partner in the publishing business Secker and Warburg. Interestingly that was a famously botched sale from the 'chinless' of Christies-- almost all the books were in tea chests and contained incredible Bloomsbury rariana, signed Virginias, Hogarth & Omega Press, scarce Continental presses and a batch of presentation George Orwells. A lot of the books went for very little and ended up with the celebrated and unlettered bookseller George Jefferys, who knocked them out on the pavement at Farringdon Road - pretty much as you see in our signature photo top corner of this web page. A friend who got a few chests was surprised when Cyril Connolly turned up at his premises (with entourage) wanting to buy from the collection. 35 years later you still see Senhouse books with his small neat pencilled ownership signature. He had the admirable habit of compiling indexes in books where the dastardly publisher had been too lazy to include one. Mark Gertler: Haven't you any self-respect? Mark Gertler: But he's a disgusting pervert! 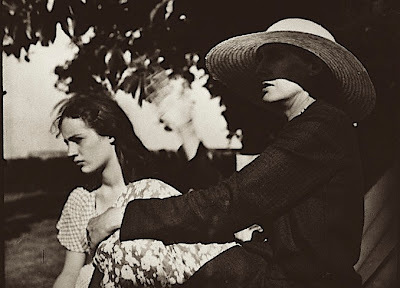 Dora Carrington: You always have to put up with something. COLLECTING BLOOMSBURIANA. There are some of the opinion that the entire coterie did not produce one masterpiece, some point to Virginia Woolf as a proven writer of world class books. Some talk of Maynard Keynes as a genius, certainly his name has been invoked enough in the current slump. Huge claims can be made for E.M. Forster. A fellow dealer opines that Bloomsbury collectors are the maddest of the lot. Most would not have been welcome at Charleston or Monks House. I once had a copy of Strachey's label in a book (no recollection of the title, but it was rather fetchingly bound in glazed pink moiré cloth) that I found in the large ground floor back room of Francis Edwards on Marylebone High St. Paid £1/1/-. No idea what became of the book, either. Oh dear! You could well be right. The binding was not decorated or lettered and had no spine label. No idea where it went or when, but I must have sold it. Quite likely to Rota in their Savile Row days. Easy come .... I shall spend the remainder of my conscious life worrying about it. I also bought a copy of the 1888 Walt Whitman Complete Poems & Prose, signed, at the same time from Edwards for £2. Do know where that went.